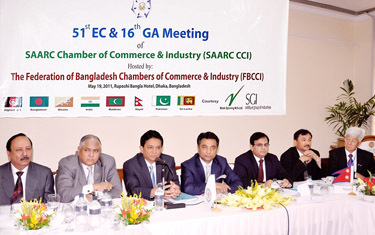 The 51st Executive Committee Meeting and 16th General Assembly Meeting of SAARC CCI were held in Dhaka on 19th May, 2011 under the chairmanship of Mr. Annisul Huq, President, SAARC CCI. 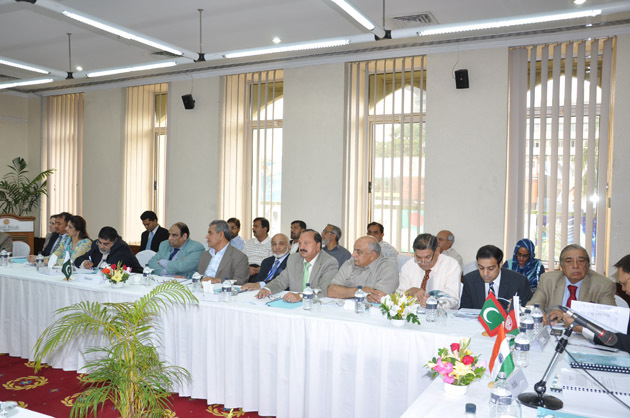 The meeting was attended by representative from national chambers completing the quorum wherein some major decisions were taken which includes amendments in the SAARC CCI constitution, date of 4th SAARC Business Leaders Conclave and approval of SAARC CCI shipping council. 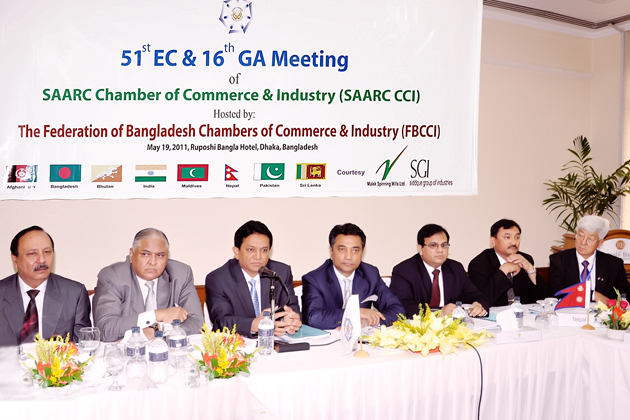 Seen in the picture(from L to R) are Mr. Abul Kashem Ahmed, Vice President SAARC CCI (Bangladesh), Mr. Tariq Sayeed, Immediate Past President, Mr. A K Azad, President, FBCCI, Mr. Annisul Huq, President, SAARC CCI, Mr. Iqbal Tabish, Secretary General, SAARC CCI, Mr. Pradeep Kumar Sharestha, vice President, SAARC CCI (Nepal) and Mr.Rajendra Man Sherchan, GA Member, SAARC CCI. 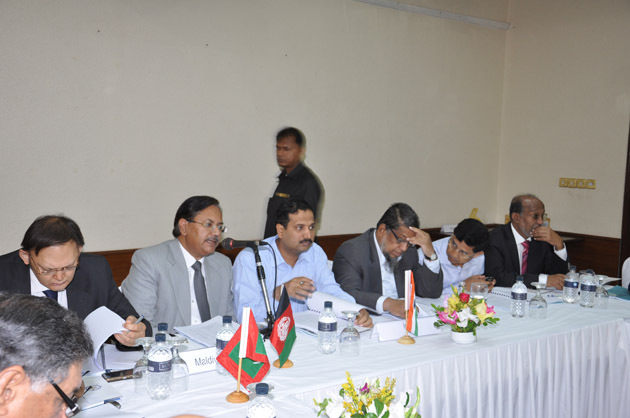 The fourth SAARC Business Leaders Conclave will be organized in Kathmndu Nepal on 22-23rd September, 2011. 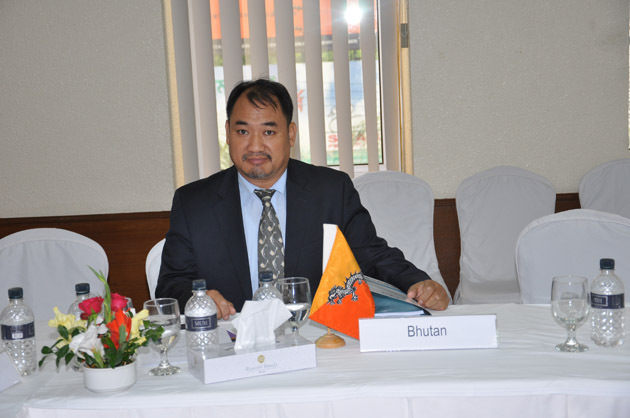 The conclave will be organized in cooperation with Federation of Nepalese Chambers of Commerce & Industry in partnership with Friedrich Naumann Foundation (FNF). The house appreciated the wonderful performance of SAARC CCI in last during last one year. 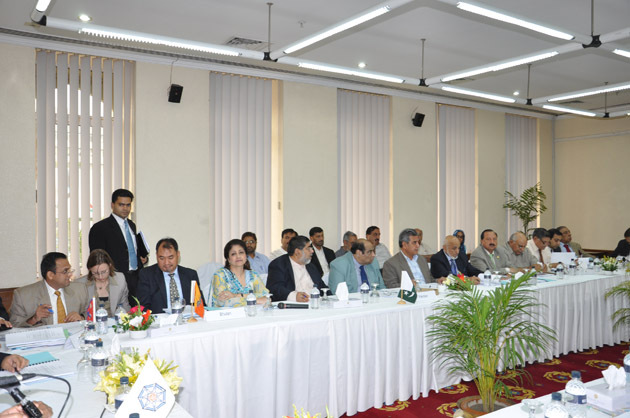 At the conclusion of the meeting, Mr. Salman F. Rehman, Past President SAARC CCI while appreciating the performance of SAARC CCI said that it is time to move from talks to walk. 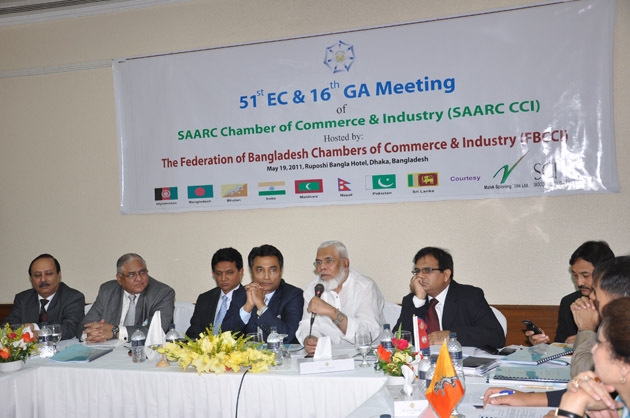 He urged upon National Member Bodies to enhance their role & interest in SAARC Chamber of Commerce & Industry. He also proposed to assist SAARC CCI in grant of donation from Government of Bangladesh for construction of headquarters building.